How long should I wear dentures for? For the first few days after being fitted with dentures, you may be advised to wear them constantly. Once your mouth gets used to wearing them, you should remove dentures before you go to bed. This will allow your gums to rest and prevent any fungal infections from developing. Well cared-for dentures should last several years but they may need to be relined or re-made after normal wear or after any changes in the shape of your mouth as your gums or bone shrink. Poorly fitting dentures can lead to several problems, including discomfort, bad breath, mouth sores and infections. Will dentures affect how and what I can eat? Once you first start wearing dentures, you may want to get used to eating with small pieces of soft foods, while avoiding any particularly hard or sticky food. Once you are more familiar with dentures, you should be able to return to a normal, healthy diet. Will my mouth require special care? Even if you have full dentures, you should still take good care of your mouth. Brush your gums, tongue and roof of your mouth twice a day with toothpaste and a soft toothbrush. If you have partial dentures, your natural teeth should be cleaned twice daily to prevent tooth decay, gum disease and any future loss of teeth. What is the best way to care for dentures? Dentures need to be cleaned as dutifully as natural teeth and are just as susceptible to plaque and trapped food deposits. At least every morning and night you should brush them with paste or soap and water before soaking. Then, they will need to be soaked in a denture cleaning solution. 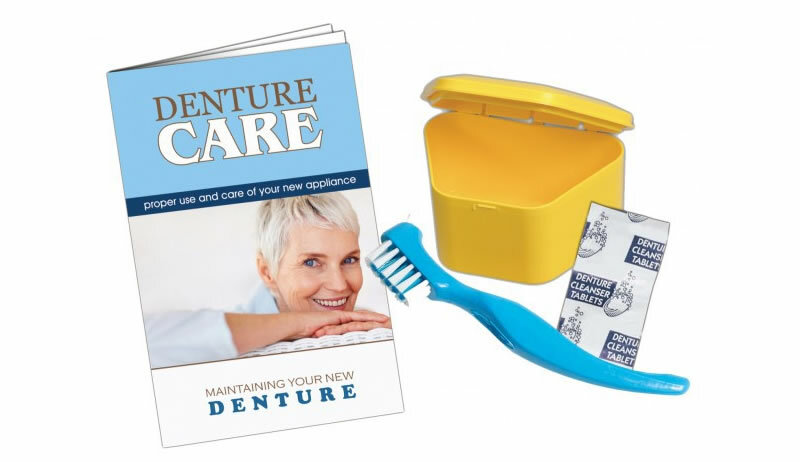 Particular care needs to be taken to remove any traces of denture fixative. Finally, your dentures need to be brushed as you would your own teeth, with denture cream and a small-headed toothbrush. If your dentures have a plaque build-up or stains, your dentist or hygienist can clean them for you. If you remove your dentures overnight, store them in a small amount of water to stop them warping. Remember that dentures can be quite delicate and may chip, crack or break if dropped, so take extra care when cleaning them. Do not try to adjust dentures as you may damage them beyond repair.